When Scott Ferganchick and Bart Topp met on Alaska’s North Slope eight years ago, they could have never predicted that they would go from being coworkers to friends to brothers. Scott, a longtime Alaskan and ConocoPhillips employee, is a maintenance mechanic at the CPF2 facility at Kuparuk. He and Bart, who has been with the company since 2010, shared a shift and quickly became friends. One day in February 2015, Scott headed up the Slope for as usual. This shift took a turn, however, when he was quickly sent back home after experiencing pain and unusual symptoms that required medical attention. Medical testing in Anchorage showed something unusual: Scott had been born with only one kidney. Further testing in Arizona, where Scott spends his winters, revealed a grim diagnosis: kidney cancer. His doctors tried an experimental surgery in hopes of saving Scott’s one kidney, but the cancer was too advanced and the operation was unsuccessful. Scott would have to live on dialysis while awaiting a new organ. 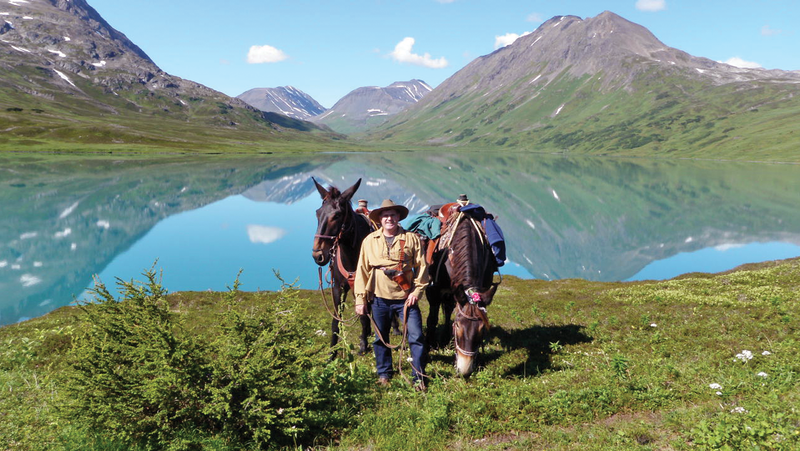 In the three years that followed, Scott went from being an avid outdoorsman with a passion for packing and riding mules and horses with his family to a life consumed by doctors, hospitals and dialysis sessions. To be eligible for a donated organ, you must be cancer-free for two full years. In May 2017, Scott finally received clearance from his doctors for family members to start testing to see if they could be a donor. One by one, they were deemed incompatible. That following August, Bart flew to the Mayo Clinic in Arizona to begin five rigorous days of testing. Bart had visited Scott in Arizona a few times when he was on dialysis and had watched his friend’s health deteriorate. Many of Scott’s coworkers also offered to test for compatibility, speaking to the true familial relationships that develop on the Slope. Bart was approved as a match. After several years of pain, exhaustion and uncertainty for Scott and his family, his friend and coworker was about to give him a second chance. The surgery was scheduled for November 29, 2017. With the complete support of his supervisors and ConocoPhillips, Bart was able to use short-term disability coverage for time off to complete testing and his eventual donation. With an organ from a live donor, the chances of a successful transplant are greatly increased. Bart’s transplanted kidney started to function immediately. The gray pallor that had taken over Scott’s complexion instantly gave way to the healthy pinkish hue neither he nor his family had seen in several years. On February 3, 2018, almost three years to the day since Scott’s kidney started to fail, he got off the plane at Deadhorse, met Bart in a waiting truck, and the two rode to Kuparuk together, ready to get back to work. Bart says he is back to feeling 100 percent — he can’t even tell he’s missing a kidney — and Scott is getting stronger every day. Bart received a 2018 ConocoPhillips Lifesaver SPIRIT Award for his donation to Scott but agreed to be nominated only to raise awareness of kidney cancer and emphasize the importance of early detection and treatment. When telling his story, Scott repeatedly mentions the support he received from his supervisors, coworkers and ConocoPhillips that allowed him to focus on his family and treatments. He shares a few lessons he picked up on his journey: never ignore symptoms; always get a second opinion; consider organ and blood donation; take care of your friends, your family and your community; and always stay positive. Scott credits his wife, his children and his faith with helping him through this difficult time. And of course, his friend and brother, Bart. ConocoPhillips provides travel benefits to help U.S. employees, including those in remote locations such as Alaska’s North Slope, access specialized healthcare facilities for complex procedures. When local access to top-tier care is not available, the company covers round-trip transportation and lodging for the patient and one adult companion, up to $10,000, to ensure they receive the best care. This benefit covers travel for organ and bone marrow transplants, bariatric, cardiac and orthopedic surgeries.